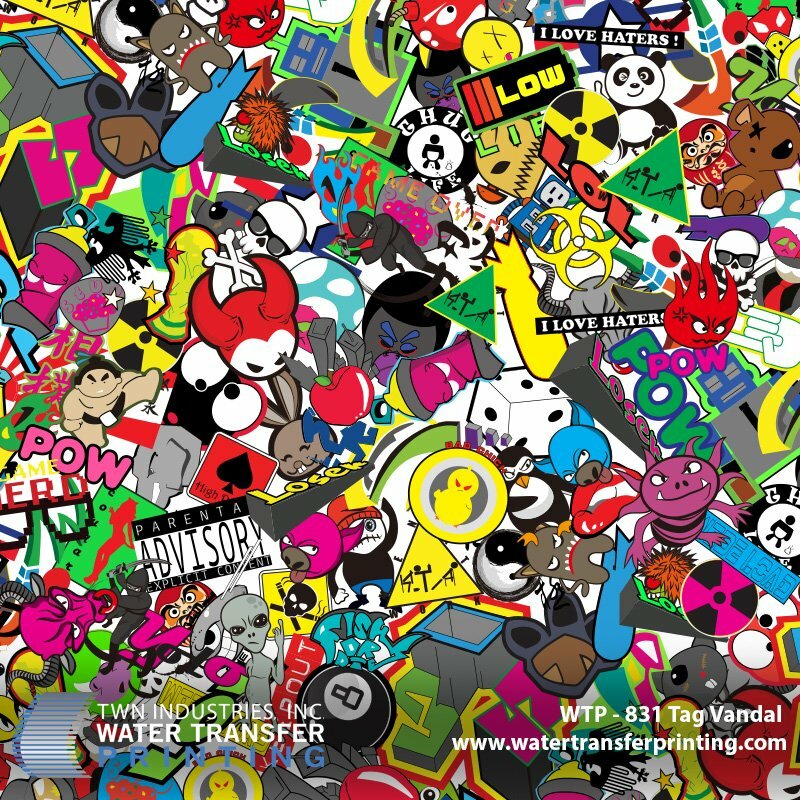 PRINCETON, FL – July 21, 2015 – TWN Industries Inc., the leading Water Transfer Printing supplier, announces the release of their one-of-a-kind pattern: “Tag Vandal.” The new design was inspired by the wildly popular “sticker bomb” style. This style originated by placing multiple stickers in a randomized and chaotic fashion on objects such as laptops, car fenders, game consoles, controllers, helmets, and even on automotive interiors. What truly differentiates TWN’s sticker bomb pattern from others in the market, is the fact that TWN’s design team hand-drew each and every of the 80+ characters and logos. While this dramatically increased the time and labor required for the project, the move was crucial in ensuring that no copyrights were infringed upon. Unfortunately, most of the sticker bomb patterns available today include copy-written images and logos, essentially rendering the designs useless for mass-market production. Both manufacturers and processors can rest-assured that using Tag Vandal will allow them to decorate their products with a unique sticker bomb style, without the worry of copyright infringement. Tag Vandal water transfer printing film is available exclusively through TWN Industries, Inc. Call now to place your order and film requirement. Shipments of Tag Vandal film will begin approximately July 27. The part number for Tag Vandal is WTP-831. To purchase film, or to find a TWN Certified Decorator who can decorate products for you, call 305-258-9622.